Rep. John Lewis is now backing Obama. ATLANTA (CNN) - Georgia Rep. John Lewis, who backed Hillary Clinton in his state's Democratic presidential primary, announced Wednesday that he is switching his support to Barack Obama to reflect the will of his constituents. "Something is happening in America," the 11-term congressman, a bloodied veteran of the civil rights movement, said in a statement issued by his office. "There is a movement, there is a spirit, there is an enthusiasm in the hearts and minds of the American people that I have not seen in a long time, since the candidacy of Robert Kennedy." In a statement issued Wednesday afternoon, Obama called Lewis "an American hero." "I am deeply honored to have his support," he added. Lewis endorsed Clinton, the senator from New York and former first lady, in October. But his central Atlanta district went strongly for Obama, the senator from Illinois, in Georgia's Feb. 5 primary - forcing what he called "a difficult decision" for him. "As a U.S. representative, it is my role not to try to subdue or suppress the will of the people, but to help it prosper and grow," he said. 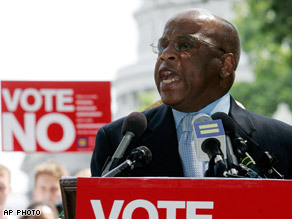 Lewis is a member of the Democratic leadership in the House of Representatives and a Democratic "superdelegate," one of the elected officials and party leaders who will not be bound by the results of primary elections or caucuses when they vote on the party's presidential nominee at its August convention in Denver. He is also a longtime friend of Clinton and her husband, former President Bill Clinton, and said he had "a deep and abiding love" for both. But he added, "I think the candidacy of Sen. Obama represents the beginning of a new movement in American political history that began in the hearts and minds of the people of this nation. And I want to be on the side of the people, on the side of the spirit of history." Lewis' announcement comes less than a week before next Tuesday's Democratic primaries in Texas and Ohio, which Clinton is banking on to break the Illinois senator's 11-contest winning streak in the Democratic race. The two held a heated debate in Cleveland on Tuesday. Clinton did not answer reporters' questions about Lewis' reversal at a Wednesday afternoon campaign stop in Zanesville, Ohio. But campaign spokesman Doug Hattaway told CNN that the candidate "respects Congressman Lewis enormously, and she respects his decision." Lewis declined further comment to reporters as he left the House floor Wednesday, telling them, "I'll let the statement speak for itself." In announcing his endorsement of Clinton in October, Lewis called her the Democratic candidate "best-prepared to lead this country at a time when we are in desperate need of strong leadership." But despite the support of Lewis and other leading African-American politicians, Obama beat Clinton by better than 2-to-1 in Georgia's primary, with overwhelming support from black voters. Lewis' fellow Georgian, Rep. David Scott, has told news outlets he would support Obama in Denver rather than go against the will of voters in his suburban Atlanta district. The Lewis endorsement follows Tuesday's endorsement of the Illinois senator by former Democratic presidential candidate Chris Dodd, who called for the party to unite "behind a candidacy that expresses the aspirations, the hopes, the ambitions of millions and millions of Americans." Dodd warned that Democrats are in danger of damaging their fortunes in November with a divisive campaign, but said he is not suggesting Clinton should drop out of the race. The Connecticut senator dropped his presidential bid after the Iowa caucuses Jan. 3. Obama currently leads Clinton in the number of convention delegates won in the Democratic contests to date, 1,184 to 1,031, according to the latest CNN estimates. Clinton has the support of more superdelegates, however, leading Obama 237-181, according to CNN's count. This is America. It is perfectly alright to change your mind or opinion about something. Nobody in Hillary's camp complained or whined when she changed her mind on the war in Iraq or on NAFTA. So if it's okay for Hillary to flip-flop, then shut up about Lewis. Way to flip-flop. Putting his finger to the wind, just makes him look bad. Though I am glad to see Lewis support Obama, I must say that I do not like the way he was forced to do it. But then again, what choice does he have? He is in office to represent the people that voted him in, and if they are saying Obama is what they want, then he should do all what is in his power to make it happen. But then again, this is what happens when you have these unwarranted "superdelegates". If the Democratic party would truly act like a democracy and let the PEOPLE decide, then Lewis' vote would count for just one regular vote and we wouldn't be having this discussion right now. Yo and clarity- I don't care if you respect his decision or not but do not bash John Lewis. What he has done for civil rights is beyond respectable. He is a civil rights champion and a true American hero. p.s.-This coming from a white male. But of course it's not about race...... If John Edwards had carried Georgia I'm sure repesentative Lewis would have jumped ship to support him as well. "McCain will get my vote if Hillary is not our nominee!!!"? Is this what our party as come down to? Are Hillary supports so upset that Obama is doing well that they are willing to allow a Republican into the White House than a fellow Democrat? I think it might be time to remember that we are on the same team and that this in-house fighting shouldn't impact whoever is running in November (Hillary or Obama). Also, the fact he is African American is the only reason Lewis is changing sides? People out there really think that? Some of you really need to cover up your racism a little better than that...heaven forbid Lewis changes his mind because he believes Hillary has been doing poorly these last few weeks. Nah, he MUST of have been motivated by race.